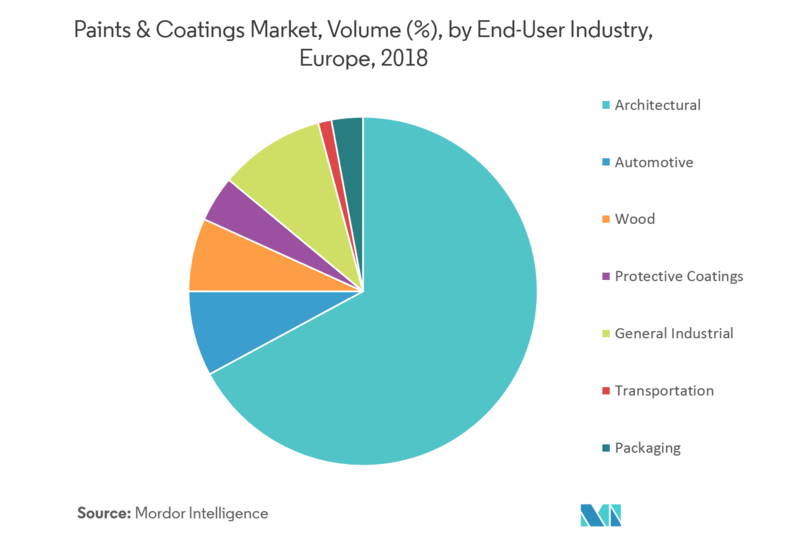 The Europe Paints and Coatings Market is segmented By Resin Type (Acrylic, Alkyd, Polyurethane, Epoxy, Polyester, and Other Resin Types), By End User (Architectural, Automotive, Wood, Protective Coatings, General Industrial, Transportation, and Packaging), and Geography. The European paints and coatings market is expected to register a CAGR of 3.77%, during the forecast period of 2019 – 2024. 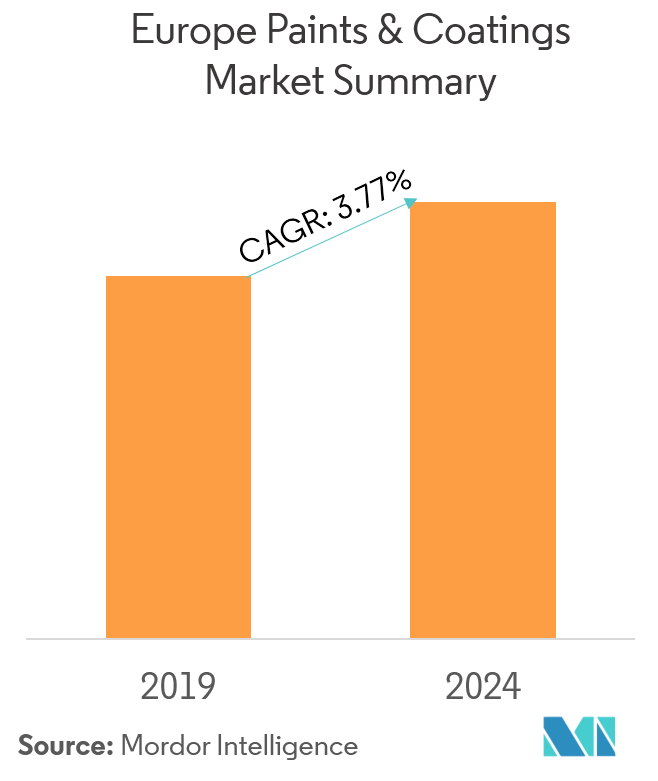 The major factors driving the market studied are the growing automotive industry in the region and a rise in the use of protective coatings in the offshore wind turbine industry. 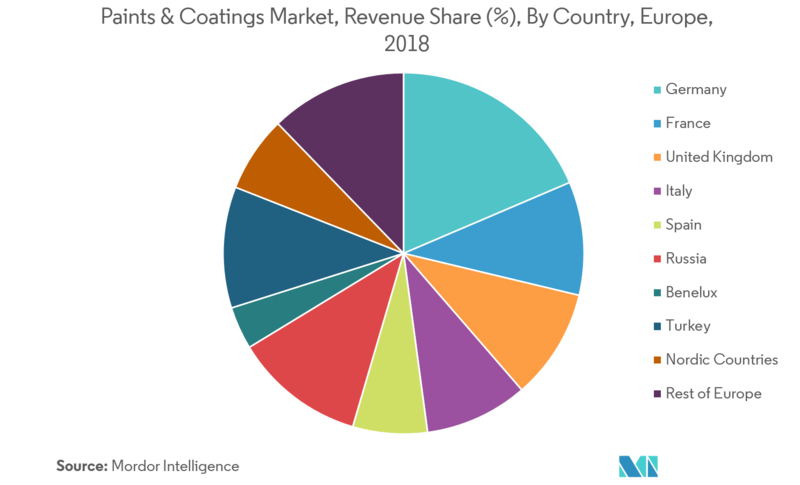 The unavailability of adequate substitutes for banned lead chromate used in industrial coatings and increasing prices of raw materials are expected to hinder the growth of the market studied. Increasing demand for architectural coatings is one of the major factors driving the growth of the market. Use of nanotechnology in paints and coatings is likely to act as an opportunity in the future. Germany dominated the market across Europe due to the increasing demand in the construction and automotive industry. Paints and coatings are not only used in the interior of the houses to add colors or decorative purposes, but also to perform a wide range of functions. Their functions vary depending upon the type of environment and room that they are used on. Paints and coatings are applied on the exterior of the house, not only to give them a new look but also to protect it from blistering summers, freezing winters, soaking rain, and the daily bombardment of UV radiation without fading, peeling away, and cracking. Developments in the construction sector are partly due to the robust economic growth and its positive implications on corporate profits, household income, and the state of public finances. The construction activities in countries, such as the United States, China, India, etc., are expected to drive the growth of the market. Moreover, low-interest rate level, internal migration flows, immigration, and investment backlog that has accumulated in areas, like infrastructure, since the financial crisis is supporting the upswing. 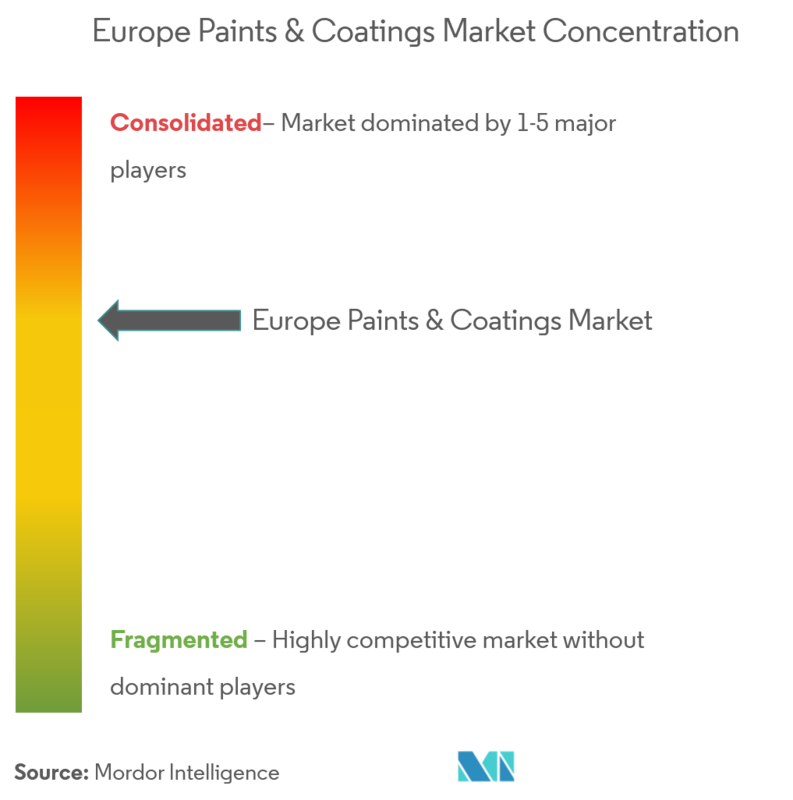 Renewed focus of European construction companies on local markets and their core business is expected to lead to an increased demand for paints and coatings during the forecast period. Germany is recognized across the world for its leadership in the automotive industry and excellence in engineering. Twenty-one of the world’s top 100 automotive suppliers are German companies. The growth in the automobile industry is expected to positively affect the paints and coatings market in the country. It is also expected to close the gaps in the German high-speed rail network. Freight trains will also travel on the route. The line is likely to open various opportunities for implementing state-of-the-art transport concepts, which marks as the beginning of a new era of rail travel and increase in paints and coatings market. Growing eco-consciousness among consumers, who are becoming aware of the detrimental environmental effects certain pack types have decreased the use of packaging coatings. However, manufacturers are working on various eye-catching designs and labeling that help create a premium image. Germany has the largest construction industry in Europe. According to industry experts, the demand for new houses is estimated to be around 350,000 per year until 2020, which is expected to boost the construction sector. The German construction sector has been growing slowly, mainly driven by increasing new residential construction activities. It is also expected that Germany would spend more on the public infrastructure and there would be an increase in investments through public-private partnerships at the municipal level. The growth in the automotive and construction sectors are expected to boost the demand for paints and coatings in Germany, during the forecast period. The European paints and coatings market is semi consolidated, with top players accounting 50% of the market. 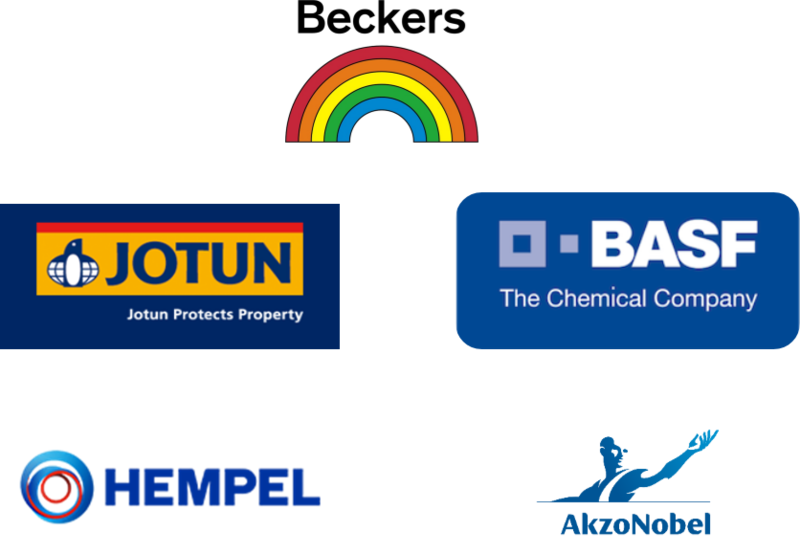 Akzo Nobel NV, BASF SE, Jotun, Hempel, Beckers Group, etc., are some of the major manufacturers of paints and coatings in the European region.